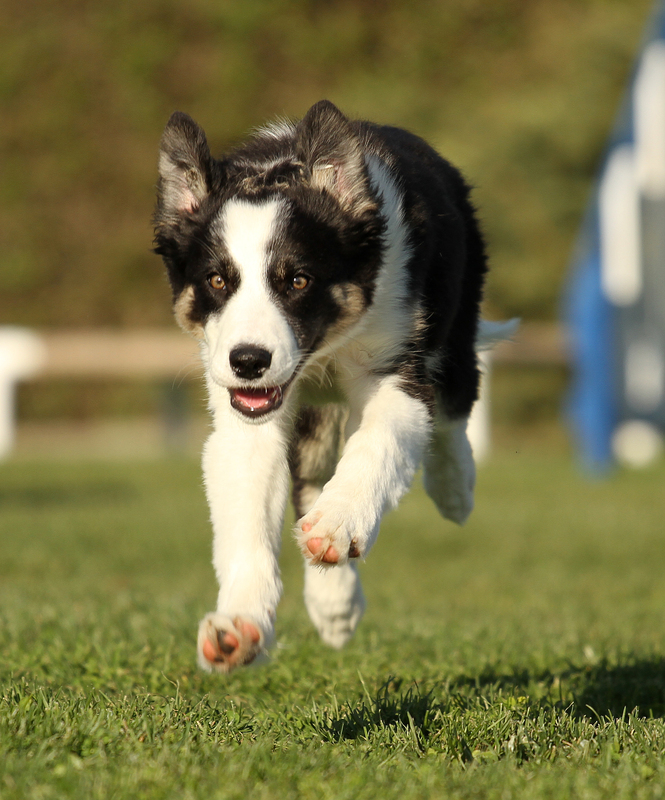 Are you FULLY ENGAGED every time you train or compete with your dog? A few weeks ago at an AKC trial I had the opportunity to watch many of the runs in both the novice and the masters’ rings. I watched students and I watched strangers and I left shaking my head at how many handlers had no engagement with their dogs at all as they walked into the ring and to the start line. That lack of engagement was immediately obvious with some of the dogs showing displacement behaviors like sniffing, sight-seeing, scratching, getting up from start line positions, not releasing from stays and generally showing a total lack of enthusiasm or desire to get out there and play with their handlers. This lack of engagement was at times followed by non-qualifying and lack luster runs with a distracted dog and a distracted handler. 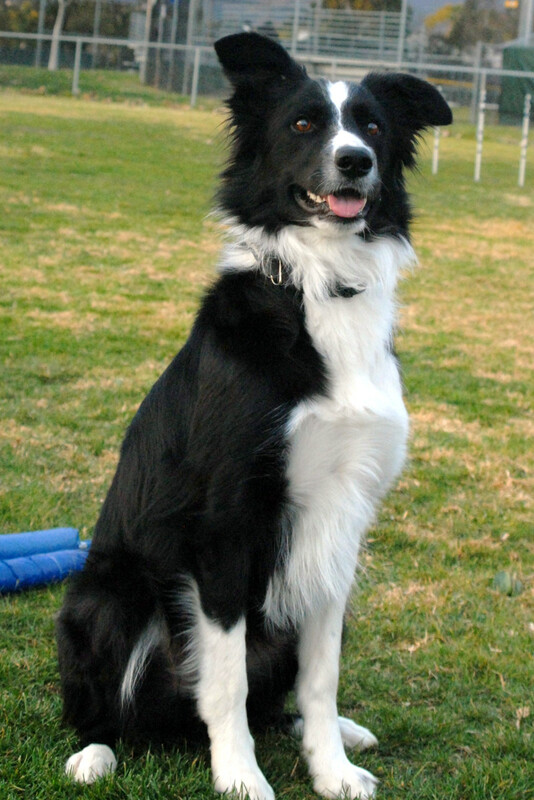 I know handlers are nervous at times before a run, it happened to me that weekend running my young border collie Pie in AKC for the first time. But I knew I had to override my novice dog ring nerves and take care of my dog. The start line is the last place handlers should be distracted and looking around the ring to see where the course goes, but that is what they seemed to be doing. 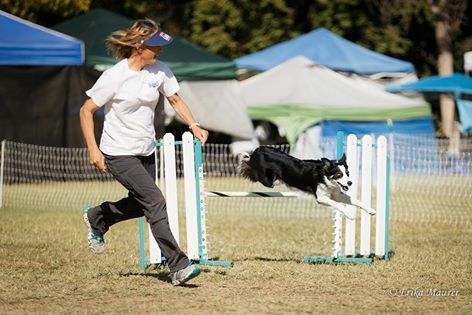 The dog follows them on leash into the ring obediently, the handler makes no eye contact as they are distractedly looking around to find the first few jumps and remind themselves of the course flow. Then they rip off the leash and leave the dog with a look on its face as if they have never met this stranger who took them into the ring. What does it mean to be totally engaged? It could be lots of things, but overall there should be an obvious emotional and physical connection between handler and dog that could be visible to anyone watching. The handler could be engaging the dog by doing little tricks or games or just making some direct eye contact and verbal engagement, “are you READY to run? ” or possibly asking the dog to be attentive and obedient with quiet heelwork with a nice smile on her face, or physically prompting the dog by their own playful posture that the dog reads as time to go do something fun. While thinking about these distracted handlers, I started looking at my own start line with Pie. She tugged enthusiastically with me to the start line, and we had lots of connection there, but a few times I led out like I was running Scoop or Ace, I just turned my back and walked to my lead-out spot. I deserved the distracted look my youngster gave me one time when I turned to call her off the line, as well as the start line sit-stay that turned to a stand while my back was turned. The rest of the weekend I made sure I kept eye contact and praised her when I led out. I decided after that weekend that I really had to help my students learn how to stay engaged with their dogs at the line. Tomorrow is day one of Power Paws Camp, our 14th year of teaching summer and winter camps. I wrote an article for the Camp Workbook on staying “Fully Engaged” and wanted to share it with all of you and all of my students who don’t get to attend camp this weekend. It is written to our Campers, but of course it applies to any kind of training or competition scenario. I hope it will help you remember to stay fully engaged with your dog if you want your dog to stay engaged with you! 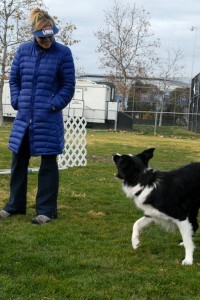 My goal instructing you at camp this year is not just to help you learn how to train and handle your agility dog more effectively; I want to help both you and your dog have more fun and stay more connected to each other. Success in our sport requires focus/connection and what I call engagement. You need to be fully engaged with the training and what you plan on doing with your dog on the course and you want your dog fully engaged in the process. I have a goal for you at Camp this year. A goal of staying connected to your dog and him to you. From the moment you get your dog out of its crate to begin an exercise you need to have 100% of your dogs’ attention and you want to bring your dog to the correct state of arousal for the job before you get to the start line. 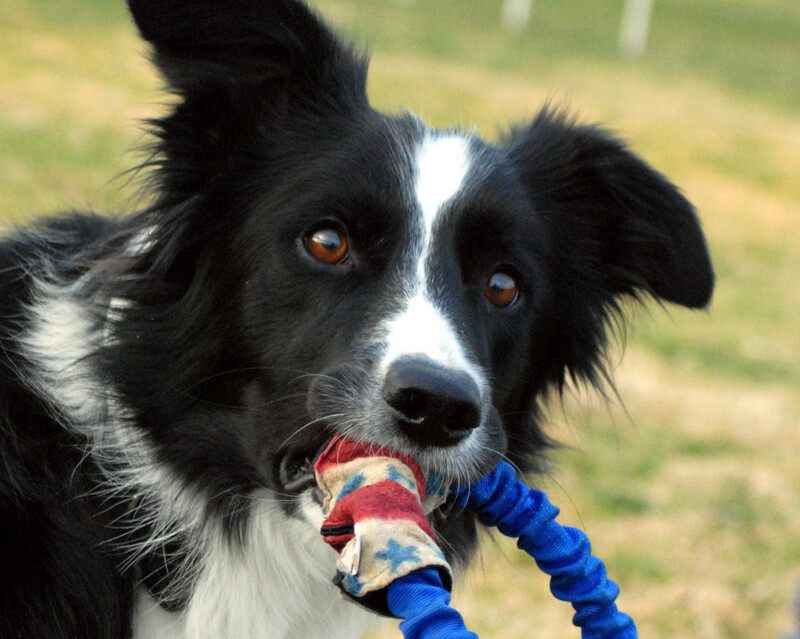 A dog that is distracted needs to be focused back to the handler with tugging/tricks/or focus games. Try hand targeting, high five, figure-8 between your legs or other handler focus games before you run. When tugging with your dog, YOU get to disengage/end the tugging, not the dog. The goal for tugging is that YOU have to ask your dog to stop tugging and get the toy back from them not vice-versa. Try not to let your dog disengage from the tug game until YOU are finished and they were solidly tugging with you before you ended the game. EYE contact. Give it and ask for it and don’t start a run without it. A dog that is half asleep needs to be woken up and mentally and physically prepared to go play/work. AFTER you wake up and arouse your dog, you need tugging or silly tricks or some animated ground running work to engage them. Try scratch/rubbing your dog excitedly through their rib cage area to get their blood flowing and hope the brain follows! A dog that is over the top excited needs to be helped to have calm focus before the handler attempts a drill. Soft eye contact and quiet talk may help to calm them. If you are tugging keep it low key, the toy down at your knee or ground level, and don’t encourage growling. A dog that is stressed by the surroundings needs some fun/happy/silly talk from the handler so they forget to be worried. Look them in the eyes, give ‘em a kiss and ask them to trust that you will do the right thing to help them play through their fear. A suspicious dog that comes out of its crate and is immediately looking for a dog to warn away or chase needs some very special focus work on the handler and they need to be in motion WITH the handler and prevented from staring at other dogs through focus games and possibly control head halters on their way from crating to start line. If your dog will stay focused on you while tugging that is likely your best offense. In order to do any of the above things to get your dog engaged, YOU need to be fully engaged. Don’t turn your back on your dog or mentally “drop” them. This goes for the start line and in between obstacles if you have a whoopsie and need to start over. When you walk to the start line keep your dogs’ attention by making eye contact, tugging, praising or saying silly stuff so that your dog knows that you are being attentive to them. Call your dog to you immediately, don’t let them wander. Don’t talk to the instructor until you get control of your dog! Tug if possible, or give them a treat if appropriate to the situation and if they responded to the recall immediately. You could also ask them to lie down or sit and praise them for doing so. If you have called your dog to you, gently hold them by the collar, or kneel down next to them. You could put your arm around them and cuddle them to your side to gently confine them so they can’t nick off or get distracted by dogs, people or surroundings. Small dogs could be picked up, but don’t grab at them, and try often to keep your small dogs feet on the ground where they play and work. Always take a few moments to re-engage or play with your dog before you start the drill again. ALWAYS re-engage and reward your dog at the end of every run. Throw your toy, or have a game of tug. If you can’t tug or play retrieve then stay engaged with extremely lavish praise and some kind of physical play or a bit of rough housing one-on-one connection and of course eye contact. Don’t dis-engage from your dog until he is off the course and back at the crate area. If you need to talk to the instructor or repeat some part of the drill, reward and play momentarily, THEN go get the info from your instructor. 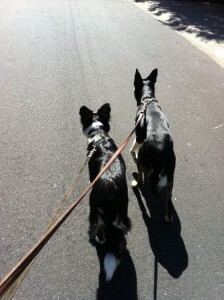 Stay fully engaged with your dog and it is likely your dog will stay fully engaged with you! PS:Thank you Erika Mauer for the Pie photos from the trial! I haven’t written much about Pie but I hope that’s about to change. My fearful little flower is blooming into a real agility dog. The dog Pie wants to be is wild and crazy and a bit on the mouthy side. The dog Pie turns into when she is frightened is anything but that. She is almost 2 years old and recently competed in jumpers’ classes at three USDAA trials. She had 5 out of 6 clean jumpers runs and is one leg away from masters’ jumpers. Her runs at the trials were fast and “on the edge”, nothing less than I would expect from a fast and excitable young border collie. Until a few months ago I did not know if I would be able to compete with her. This is the story of where she’s come from and where we are today in dealing with her fear issues. 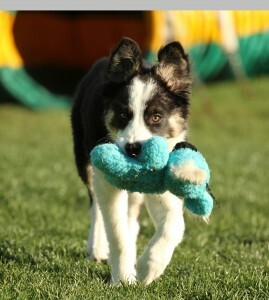 Pie came home with me at 8 weeks as a happy-go-lucky young border collie; smart, playful, athletic and fun to train. 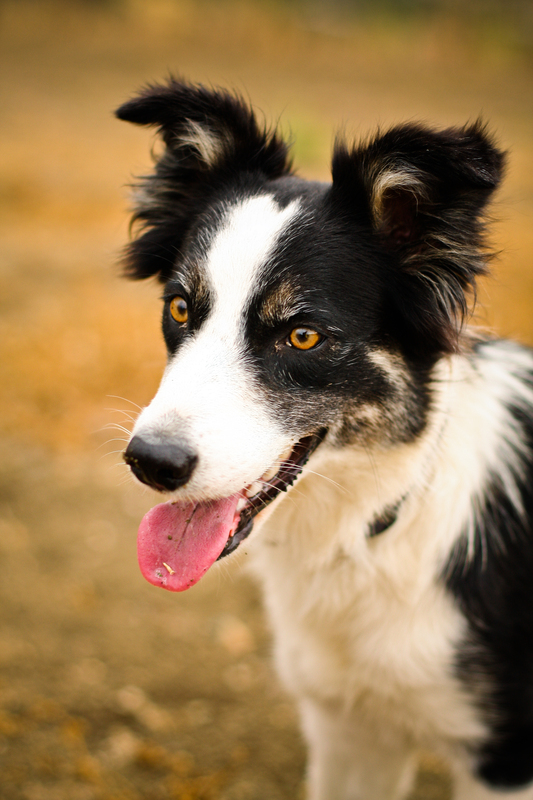 Her parents are emotionally stable dogs with hugely successful herding careers. She was raised by the breeder in a perfect environment for puppies, but by the time she was 10 weeks old I realized I had a problem. Pie is fearful of moving cars. It started with walking from our house to the agility yard. Pie and I had to walk through the parking area where cars were arriving for classes and she decided she was inconsolably afraid of those moving vehicles. Within days this transferred to her being worried about walking past our parked cars at the house, which then transferred to her not wanting to put the leash on and even begin the walk to the agility field to play. We have a yard in front of our home where our dogs hang out part of the day. She decided she did not even want to be in that yard because she could see traffic arrive. She would claw the front door in panic to come back indoors as soon as she heard a vehicle. 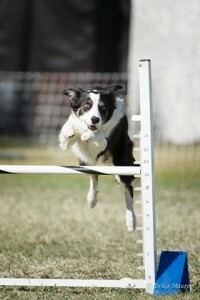 We really don’t have that much traffic, we have only 14 scheduled agility classes per week. We have 15 acres of fenced hills and fields surrounding our home and training field where I exercise my dogs and it did not take long before Pie could identify a car coming down the road from a quarter mile away while we were on our walks. At first she just froze, but then she decided if she was off leash that she could run towards home until she came to the last fence, leaving me and the other dogs out of sight in a far off field. An individual car was scarier than a busy highway. We live on a quiet country road, one car is obvious. In places where there was a fair amount of traffic she was better than she was in my own front yard. This fear is very similar to the wariness a dog may show when one person approaches directly towards you while walking down a quiet street or across an empty field. One car was suspicious, and hard to miss. A bunch of cars was just noise, just like a group of people will often not worry a dog that is reactive around a single stranger approaching. Her fear is not as simple as that explanation, but it reminds me of other reactive dog behaviors towards a single salient object. Pie is better around a freeway than a country road with cars passing intermittently. Lucky things about Pie’s fear- It did not carry over to other kinds of noise sensitivity. She doesn’t seem noise sensitive or reactive to other stimulus. She does not care about riding lawn mowers or tractors or all sorts of other machines in and around our home. Her fear is isolated to pretty much one thing. Remarkably Pie is not afraid of riding IN a car; she just could not tolerate watching and hearing one approach. Once a vehicle moves away or is out of ear shot she recovers almost immediately. Her fear reaction is immediate but her recovery is almost as fast. Training, exercise and socializing my puppy were difficult. During quiet time on the property she did reasonably well playing and training in my back yard, that is until she heard, or thought she heard a car. Her typical behavior was to freeze and lie down at best. At times in the agility yard she would run to the gate to leave, or in my back yard, she would return to the house. The times she had the biggest reactions was when we had a transition between training or play when there was nothing going on between her and I for a moment. When she was really tugging on a toy or doing some kind of high arousal or running activity, she was less likely to think she heard a noise suggesting a car was on approach. Stay behaviors were especially difficult because while she was on a sit or down stay she had time to think about how she wanted to react to a perceived noise. The noises she would hear were often imperceptible to me. From the agility yard it is a least 400 feet to a quiet road, and the yard is surrounded by tall hedges that obstruct all view of traffic, but still at times she would stop what she was doing, flick her ears back and forth, and wait to discover if the noise she heard meant a car coming up the driveway. Traveling with Pie was easy once she got into the car or RV. After she got through the door and into her crate she totally relaxed and fell asleep. Getting out of the car was worse, parking lots are full of moving vehicles. Even stationery cars were suspect. Any activity that did not put her in a high arousal state was difficult. She liked going for runs with my family of dogs and her best friends Laura and Brew as long as there was no traffic within view. If she was IN an aroused state she was less likely to notice that a car moved through the vicinity. But she will not take food or play if the moving vehicle was noticed before she was aroused. Trying to actively work on counter conditioning this fear seemed to make things worse. For a long time I would schedule walking her to the field when I knew traffic was coming and attempt to do some targeting, food rewarding or play, but most usually this ended with her wanting to run back to the house. At one point I decided not to take her off the property for about 6 weeks. I gave up on asking her to hang out in the dog yard in front of my home, she stayed in the house with me and went where I went if it was “car-safe”. We did not walk through the parking area when there was any threat of a vehicle arriving for a couple months. For more months we didn’t walk in the fields closest to the road. In other words, I just pretty much avoided most car fear meetings and hence reactions. This may have helped or it may just not have made anything worse. I consulted with canine behaviorist Daphne Robert Hamilton for ideas on helping Pie get through this fear. She had some great suggestions, like teaching her to target stationary cars. Pie has a “feet” cue. She will put her front feet on any item or wall which I indicate, so I would walk around my cars and RV asking her to put her front feet on the vehicle and then I would mark and reward the behavior. Eventually she could target stationary cars with their motor running. Targeting as well as other ideas of Daphne’s all helped but still we were making only tiny steps of progress. It didn’t get worse, but it also didn’t get remarkably better. And then about 4 months ago we started to take little steps forward that gave me hope she would recover from this fear well enough to at least live a happy life here at our home and in the fields where we exercise and play. I am not willing to risk her life in order to have an agility career with her. If she decided to leave me while doing agility at a trial the possibility exists that she could get lost or run towards a busy road in her effort to get away from a moving vehicle. That’s a risk I am unwilling to take. But today I think a career in agility with Pie is more than just a possibility! Trying to distract her using food and toys after she was in a fear scenario- useless at best and possibly counter-productive as when the toys and food appeared she was already frightened. Rewards = fear? Doing any kind of control training (stays, positions, static targeting) with her if there was even the slightest chance a car might arrive. If she had a fear moment when she was on a sit stay, she did not want to stay again in that environment for a while. Her ears would flick and she heard all sorts of imaginary cars. Trying to train anything when she was having a “moment”. Spending hours hiking and playing around fields on dog show weekends that have constant traffic sights and sounds. Going out for occasional car “experiences”, but not flooding. Making her tug toy crazy. Making agility crazy fun- The catch 22 is that it’s hard to make agility an “arousal activity” when you can’t train agility. I never start training when she is in a fear moment-I always wait for it to pass, but she will train and tug now through a car arriving if I don’t let the arousal end before the car disappears or turns off its engine. Ignoring her if she does leave us on a walk, and I just loudly play with the other dogs making her jealous until she returns. Sending her to my friend Laura’s home for visits when I am out of town teaching- This really helped. The social experience was good since she missed out on much of that growing up. Laura and her dogs go for a few mile walk daily where they meet cars on a more regular basis than she does on my walks with her and she was with her best friend Brew. I think those visits made a huge difference. Letting her grow up and not really trying hard to be perfect in our agility training, but using agility NOW as something that can actually distract her from her fears. I can train in the agility field as often and anytime I want, when she is doing agility she never notices the cars that might be out on the far road. She will only stop working if a moving car is close and especially if it is noisy. When the noise is gone she goes right back to work. If she is tugging she is much less likely now to stop, and will tug through a car arriving on the property. It has been a few months since she stopped working/playing when we are in the yard behind my home where she cannot see cars. She is happy being in our front “dog yard” and does not seem to react now when a car is visible. For the last month she has stayed with us in the scary field next to the road on daily walks and I never avoid hiking in that field. If a noisy car comes by, she may move farther away but comes right back. She would rather run to the agility yard than walk, she wants to get past our parked cars as fast as possible, so I let her. If she is on leash we run together. I have given up trying to make her “like” being around cars, but I haven’t stopped rewarding every glimmer of nonchalance and willingness to play around the parking area. At this time if she continues to progress along this path, and we don’t end up with a scary setback along the way, I am very hopeful for a normal agility career with her. And I hope we will BOTH be brave if we do have a setback. In all of Pies’ runs in agility competition, she has tugged on her leash coming into the ring and all the way to the first jump; exactly the same as she does at home. That will forever be my signal that she is happy and wants to play the game. I can’t imagine trying to compete with her if I didn’t have that level of arousal and happiness that a simple tug toy can show me. I don’t know if I really know the reasons Pie is better, likely there are many of them. Fear is a strange beast, I don’t profess to totally understand it, but I am certainly more familiar with it’s inner workings now and have better tools to use to help my students. While our road to this place seemed frightening and long, now that it is mostly behind us (HOPING!) it seems to have passed rather quickly!